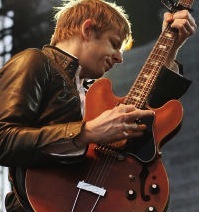 Brit Daniels of Spoon rocks the Forecastle Festival in Louisville, Ky. There are two paths to festival success: open big or grow slow. While festivals like Bonnaroo and the rebooted Lollapalooza came out of the gate with impressive lineups in large-scale settings, the modest Forecastle Festival in Louisville, Ky., has slowly built a grassroots audience over nine years as its lineup and footprint have steadily expanded. From July 9-11, more than 27,000 people filled 90-acre Riverfront Park in Louisville to hear Smashing Pumpkins, Spoon, Flaming Lips and Widespread Panic. McKnight said it cost around $1.5 million to put on the show in 2010, with 65 percent of that money going to the talent and the rest going to build the infrastructure for the site, which included erecting a power grid, bringing in water sources and staging. He didn’t release the gross for this year’s event, but said the goal is to eventually draw between 30,000 and 35,000 attendees. The event costs $150 for a three-day pass and $75 for a weekend camping spot. Over the years, McKnight has hosted such national acts as Sleater-Kinney, Umphrey’s McGee, Girl Talk, Dr. Dog, Band of Horses and the Black Crowes. He’s also watched as his initial vision of creating camaraderie among local musicians has blossomed into a three-day festival that garners national press, with headline-worthy talent booked by Nederlander Entertainment. The first Forecastle took place in 15-acre Frederick Olmsted-designed Tyler Park in July 2002, as a free event meant to celebrate the city’s diverse music community, put on by a then 21-year-old McKnight. With just $500 in overhead to produce the event, all the talent performed for free and the infrastructure was donated for a show that drew several hundred fans. The next year, McKnight invited local visual artists to join in and an environmental element was added as the fest’s attendance tripled. In 2005, McKnight raised $60,000 to cover the costs, securing sponsorships from Patagonia and Red Bull, as well as local businesses for a show that attracted 5,000. The show grew to two days in 2006 with headline acts including Sleater-Kinney, whose announcement of a split shortly after agreeing to play helped sell thousands of tickets overnight and garnered mentions for Forecastle in the New York Times, CNN, Billboard and MTV. By 2009 an exclusive partnership with Nederlander was in place to help with booking and management, which resulted in attendance of 23,000 people from 44 states and six countries for the 2010 shows. “We loved where he was going with it and we felt this was unique,” said Steve Liberatore, VP of Programming and Business Development at Nederlander Entertainment, which signed with the festival in 2009. If you’re attending Coachella this year, you might notice a few changes. Unlike years past, festival organizers are allowing fans to exit and re-enter the festival as often as they like, great news for anyone with a tent or RV that plans to attend the April 16-18 event. (Venues Today will have its own 31-foot rig at this year’s event). The other big change is that fans must buy a three-day pass to attend the outdoor festival — for the first time ever, single day tickets are not available. It’s a system that allows fans to leave and reenter the Polo Fields without a lot of confusion. The inspiration for this year’s change? Organizer Paul Tollett recently told the San Diego Union Tribune that he got the idea during the Halloween Phish festival, where the legendary jam rock band insisted organizers only sell three-day passes, with in-and-out privileges. Tollett said he was also more conscious of protecting the area’s limited supply of hotel rooms. An electronic music festival pushed to the edge of financial calamity is doubling down with a 12-city tour through the U.S. Canadian electronic act Crystal Castles is headlining the tour in support of their new album. “I’ve been trying to figure out how to take this thing on the road and this is our first jump in that direction,” said the former electronic music A&R executive, turned Rick Rubin protégé, turned DJ, turned promoter. Created in 2007, the Hard Music Festival series enjoyed an impressive run as a premier destination for the world’s top electronic music performers. Hard’s first event was on New Year’s Eve in 2007, drawing over 10,000 fans to downtown LA. Through 2008 and most of 2009, Hard began to build a name for itself with its over-the-top raves/dance parties and premier electronic dance artists, including a sellout event in 2008 at the Shrine Auditorium in Los Angeles. Not all events have been a success. The Los Angeles Police Department shut down Hard’s biggest event, an Aug. 9 concert at the Forum in Inglewood, Calif., over concerns about poor security and potential safety hazards. Guests were apparently jumping from the upper bowl into the lower bowl in an attempt to circumvent security, and some fans reportedly booed and threw bottles as they were forced to leave. Richards said he lost nearly $1 million on that event, after he refunded the 16,500 ticket holders while still having to fork over the artist’s costs. “I could have had the bands come to my house to play and gotten more out of it,” he said. Richards was able to mount a recovery by late October for his annual Hard Haunted Mansion at the Shrine in Los Angeles. In March, Hard held a lowkey test run at Club Nokia in downtown L.A. for a new club-level event. The event sold out 2,355 seats with a low-priced ticket at $13 and a high priced ticket at $35, netting a modest $70,015. For the upcoming 12-city tour, Richards said he’s booking clubs like the Ogden Theater in Denver; Stubbs in Austin, Texas; the House of Blues in Boston; and the 9:30 Club in Washington, D.C. Tom Windish from the Windish Agency is booking agent for the tour, and Richards said he’s working with a number of national and regional promoters to four-wall and co-promote the show. Tickets will sell between $25-$60 at venues fluctuating between 1,500-5,000 capacity. The tour opens at Oakland’s Fox Theater, but quickly moves to Los Angeles for an all day, outdoor festival at the Los Angeles State Historic Park. The tour’s Aug. 21 date at Terminal 5 is expected to be the second biggest draw and is being promoted with the help of NYC independents The Bowery Presents. Richards also has plans for an LA and a New York show with Sri Lankin rapper M.I.A., an indie superstar who has been largely absent from live music since her headlining appearance at Coachella in Indio, Calif. In October, Richards said he will once again host the Hard Haunted Mansion in Los Angeles, although the talent or location has yet to be announced.